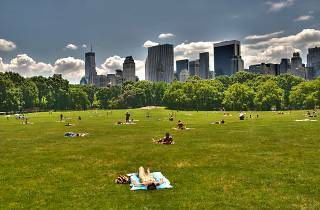 Central Park’s bucolic Sheep Meadow is a 15-acre field located along the southwestern edge of the park. Its designation as the park’s first Quiet Zone—organized sports and alcohol aren’t allowed, pets are technically prohibited, and audible music is verboten—has helped lure the crowds, making the Meadow one of the park’s most popular spots for relaxing. One of my favorite parts of Central Park! A beautiful open space almost makes you feel that you've escape NYC - except you look south and see tons of skyscrapers. This embodies the beauty that is Central Park in NYC. Perfect for a fun day with friends! The classic version of urban beach front. 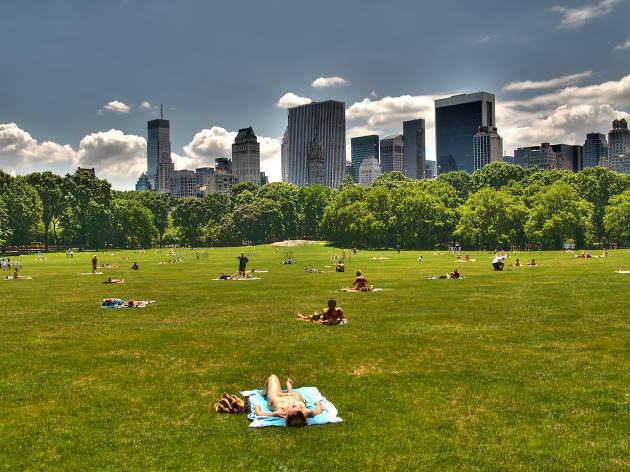 If you can't make it out to the Hamptons or "down the shore" in Jersey, Sheep Meadow is the perfect alternative. Expansive green grass speckled with those looking to catch a few rays, a Frisbee, or football. It's spacious enough not to feel like people are right on top of you even on the fairest summer days. Central Park carves out a unique sanctuary to the busy city streets while providing a beautiful view of green grass and trees. The perfect spot to relax on an easy summer Saturday or Sunday afternoon.